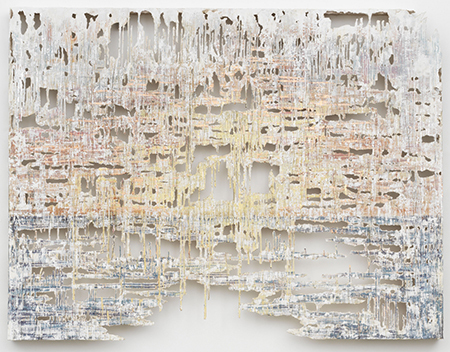 Diana Al-Hadid, "Fire Ball Falling," 2018, polymer gypsum, fiberglass, steel, aluminum leaf, copper leaf, gold leaf and pigment, 63 x 82 x 4 1/2"
New York sculptor and painter Diana-Al-Hadid presents fourteen or so works in “Temperamental Nature,” mostly mixed-media paintings, with a few drawings on mylar and sculptures, that invoke the time-honored subjects of landscape and the figure. Exuding art history — especially Impressionist and Abstract Expressionist references — without pastiche or irony, they embody those traditions while, with their unusual use of contemporary materials, bring them into the twenty-first century. The six mid-size paintings jut 3-1/2 to 6 inches out from the wall and dominate the show. Constructed of tinted polymer gypsum mounted on fiberglass and steel frameworks, further enlivened by copper, gold and aluminum leaf, the works range from a medium- to high-key palette reminiscent of Munch. The lace-like surfaces and sides of “Fire Ball Falling,” “Slow Surrender” and “Volcanic Split” suggest incompletion or decay. The patchiness of perception and memory are beautifully conveyed. Semi-abstract figures lurk in “The East Wind” as well as in two sculptures: the full figure in “By Cover of Night,” with its suggestions of Gothic arches and buttresses; and in the strange “AIT,” a bronze/gypsum/fiberglass tangle of deliquescent traceries affixed to a human foot. The latter calls to mind Balzac’s absurdist tale of artistic overreach, “The Unknown Masterpiece.” Three untitled abstract drawings on mylar display a lyrical, Johnsian help tie the overall aesthetic together with their balance of gesture and tone.